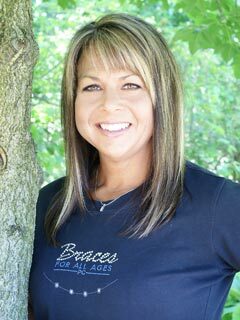 Sue is a Treatment Coordinator at Braces for All Ages, PC and has been a member of our team since 1997. As a Treatment Coordinator, Sue handles all aspects of the new patient process. She meets with patients at their first visit, the consultation. Sue takes the x-rays and digital photos on each patient and coordinates treatment along side of Dr. Brenda. Sue is a CPR certified, licensed in Dental Radiography and a member of the American Association of Orthodontics. 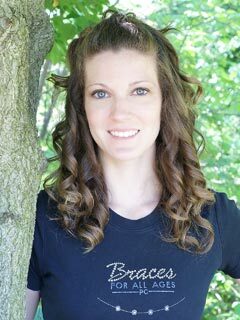 “I was very happy to have my braces done by Dr. Brenda. Even as an adult it made me feel great and I love my smile”, says Sue of being treated by Dr. Brenda. Sue has been married to her husband Randy since 1977. They have three grown daughters and seven grandchildren. When not with her family, Sue enjoys camping, fishing and sitting down to enjoy a good book. 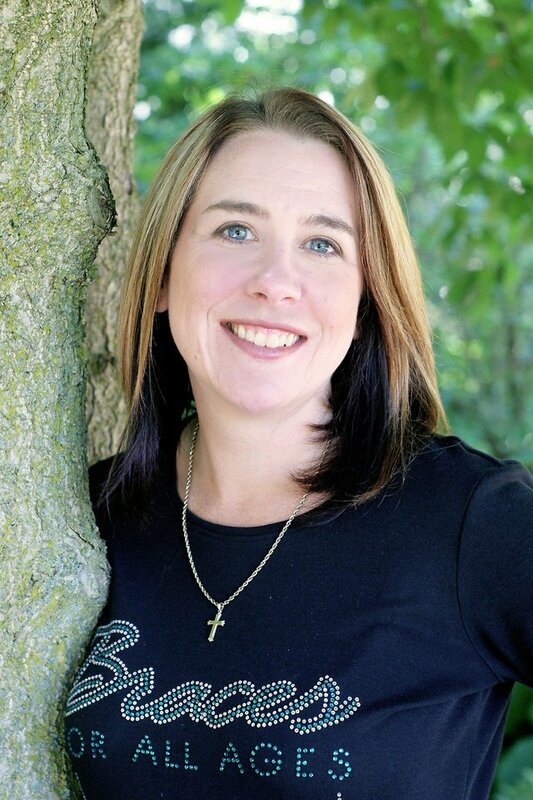 Jennifer is the Business Manager at Braces for All Ages, PC and has been a member of our team since 1998. As the Business Manager, Jen handles all aspects of management for the practice. Jen is licensed in Dental Radiography, CPR Certified and a member of the American Association of Orthodontics. 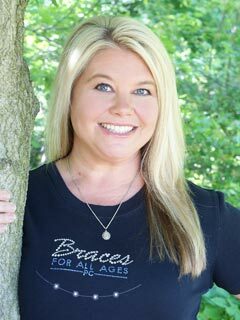 Kellie is the Professional Relations Coordinator at Braces for All Ages, PC and has been a member of our team since 2005. As PRC, Kellie manages all aspects of marketing and works at our front desk greeting patients as they arrive to our office. 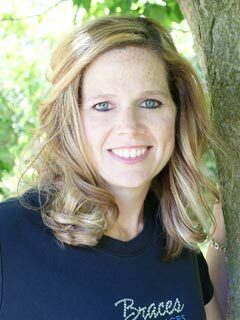 Kellie has a Bachelors Degree in Business and is a member of the American Association of Orthodontics. At the age of 40, Kellie was a patient of Dr. Brenda’s. She was very excited to have treatment as an adult; she always wanted braces as a child. Kellie is married and has four children. She enjoys going to CrossFit, shopping and spending time at home with her family. 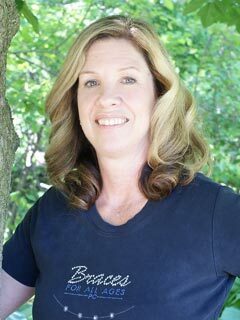 Mary is the Clerical Coordinator at Braces for All Ages, PC and has been a member of our team since 2006. As our Clerical Coordinator, Mary handles all aspects of the front desk to make sure it ran efficiently and with the highest level of customer service. Mary also leads our Improvements Team in keeping our office up-to-date to provide the best environment for our patients. Mary is CPR Certified and a member of the American Association of Orthodontics. At the age of 35, Mary experienced having braces by Dr. Brenda. Before braces, Mary hardly smiled. Now she always has a smile from ear to ear! She feels Dr. Brenda gave her the confidence she has today. Mary enjoys spending time with her family and friends, especially her husband Glenn and her son’s Joe and Jeff. She also enjoys traveling and going to White Sox games! 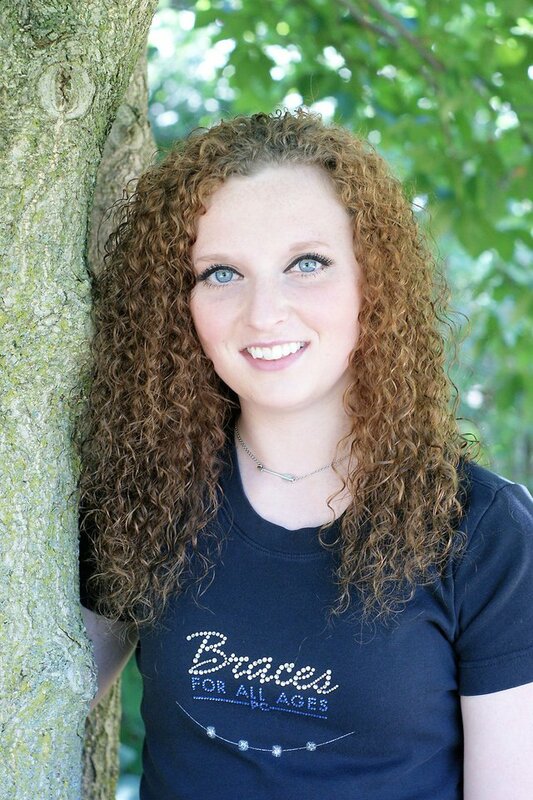 Danielle is a Patient Manager at Braces for All Ages, PC and has been a member of our team since 2006. As a Patient Manager, Danielle handles all aspects of assisting Dr. Brenda with her patient’s treatment giving them the ultimate experience of care and comfort. She is also responsible for managing the inventory process in our office. Danielle is a Certified Dental Assistant, is CPR Certified, licensed in Dental Radiography and a member of the American Association of Orthodontics. In 2001 Danielle was a patient of Dr. Brenda’s. She was treated with the herbst appliance as well as braces. Being a patient influenced her desire to pursue a career in orthodontics and she eventually became a part of our team. “I loved having braces, it changed my life”. Danielle has been married to her husband Mike since 2009. In 2014 they had their first child together, Jayce whom they love spending all their free time with! She loves to go four-wheeling, scrap booking, bike riding, walking her dogs and spending time outdoors with her friends and family. 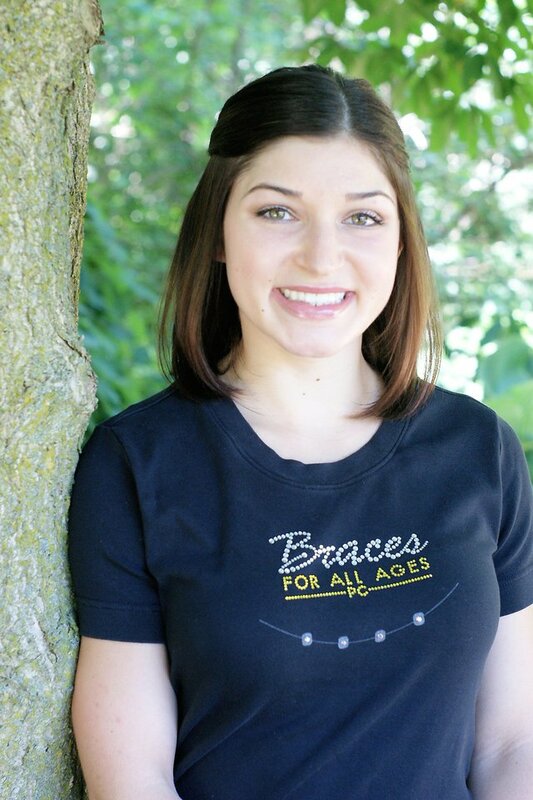 Jessica is a Treatment Coordinator at Braces for All Ages, PC and has been a member of our team since 2008. As a Treatment Coordinator, Jessica handles all aspects of the new patient process. She meets with patients at their first visit, the consultation. Jessica takes the x-rays and digital photos on each patient and coordinates treatment along side of Dr. Brenda. Jessica is a CPR certified, licensed in Dental Radiography and a member of the American Association of Orthodontics. Jessica is married to her best friend, Rob and together they have one terrific daughter, Jocelyn. They love having fun family days together, watching sports (especially the Blackhawks!) and kayaking in the summer. Alicia is our Clinical Coordinator as well as our Internet Manager at Braces for All Ages, PC and has been a member of our team since 2011. As Clinical Coordinator/Internet Manager, Alicia handles all aspects of the clinic to make sure all patients get the best quality treatment. Alicia also handles our Facebook and webpage as well as assisting Dr. Brenda with treating our patients. 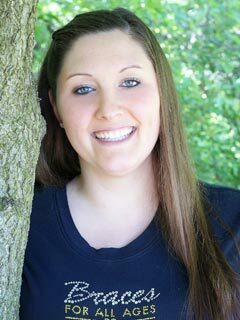 Alicia is CPR Certified, Licensed in Dental Radiography, graduated from IUN’s Dental Assisting Program and a member of the American Association of Orthodontics. Alicia loves making lasting relationships with her patients and helping Dr. Brenda give them the best smile possible. In 2015 Alicia married her best friend Aaron. They have two dogs and a cat that are very important to her. Some of her favorite things to do are spending time with her family, going on walks with her dogs, and crafting. Samantha is a Patient Manager at Braces for All Ages, PC and has been a member of our team since 2015. As a Patient Manager, Samantha handles all aspects of giving patients the best quality care. Samantha is CPR Certified, Licensed in Dental Radiography, Graduated from Olympia Dental Program and is a member of the American Association of Orthodontics. Samantha loves working with Dr. Brenda to create beautiful smiles that will last a lifetime. In 2011 Samantha married her husband Joseph. She enjoys playing with their two daughters, shopping, and taking their dog Max on walks. Lindsey is a Patient Manager at Braces for All Ages, PC and has been a member of our team since 2015. As a Patient Manager, Lindsey handles all aspects of patient care while assisting Dr. Brenda chair side with all procedures. She educates her patients about their treatment while developing strong relationships with them and their family. 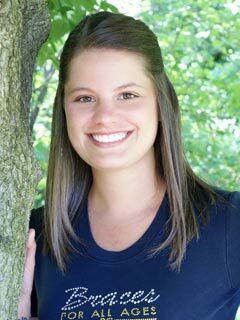 Lindsey is licensed in dental radiography, is CPR Certified and is a member of the American Association of Orthodontics. The entire Campbell family has been treated by Dr. Brenda and in 2006 Lindsey became our patient. In 2012, after two phases of treatment, Lindsey completed treatment with the Damon System and now has a spectacular smile! When Lindsey is not at the office treating her patients, she enjoys reading, working out, spending time with friends and family and being outdoors. April is the Laboratory Technician at Braces for All Ages, PC and has been a member of our team since 2015. As the Laboratory Technician, April handles all aspects of the lab which includes making bonded and clear retainers, performing intra-oral scans and tracking all incoming and outgoing appliances. April is CPR Certified, licensed in Dental Radiography, graduated from the Kaplan College dental assisting program and received her license as a Certified Dental Assistant from the State of Indiana. April continued her education to receive her certificate as an Expanded Functions Dental Assistant. April is married to her wonderful husband Kris since 2004. April and Kris have two handsome boys, Hunter and Dylan. In April’s free time she enjoys running, reading books and bowling. Kate is a Patient Manager at Braces for All Ages, PC and has been a member of our team since 2016. As a Patient Manager, Kate handles all aspects of patient care, including educating patients about their treatment. Kate is CPR Certified, Licensed in Dental Radiography, and a member of the American Association of Orthodontics. Kate enjoys horseback riding, four wheeling, reading and writing as well as spending time with family and friends.